So I filleted the Tommies and butterflied the Gar and put them in a brine of 1lt water, 1/4 cup salt and 1/4 cup of brown sugar and in the fridge for 24 hours+. Got my 'deluxe' Mojiko smoker ready but only had Samba Poultry/Pork chips, so they had to do. Smoke vent was only just open a tad and smoking well. Thought maybe 45 minutes but this 30 minutes in, so them off. Look over done to me compared to other that have a darkish tan, but they tasted ok - a little dry maybe. The Gar didn't have as much darkness to it and the taste was milder than the tommies. I've done away with the wet brine myself and just sprinkle with salt and sugar before smoking now, saves a lot of time and I don't notice the difference tbh. oh ok, do you still put in the fridge for say 24 hours? Nah whatever suits really. Whether that be half an hour or 12 hours...Happy medium seems to be roughly 3 hours. Nice job, controlling the heat is very hard in such a small smoker. I personally highly recommend a wet brine over night as it holds moisture. But i also love it when its over done and has some jerky chew too it. Each to there own! Practice, practice..
What you smoked gar fillets? Shame on you !! It might be the oils in the tommies that help keep the smokey flavour in? Must admit, they are tasting better cold! Smoked Tommies are fantastic... with a couple of beers... yummo! Cremated Tommies don't look so flash tho! I too have gone away from the wet brine and just sprinkle on salt and brown sugar before hot smoking. I'm not sure what heat source you are using, but in my little metal smoking box using a metho burner they are done in 15 -20 minutes depending on the size of the Tommies. Half the fun is experimenting. The beers went down nicely PP with the cremated tommies lol although a bit jerky style. May give the dry brine a go also - just gotta catch more Tommies haha. The smoker has 3 metho burners but I only use 1 due to the excessive heat. I watched a video where they took an hour in a proper smoker, so thought about 1/2 hour for mine. But you're right, about 15 minutes would have enough. Yeah finding Tommies metro is not as easy it used to be land based. Hickory sawdust is the favourite here when we do. Anything goes I guess,I smoked a crab once and it was quite surprising .Just threw the whole thing in and the meat was moist with a nice smokey flavour, better than fish I thought. Hi Doobie, as said above I just rub in a little brown sugar (raw) and a little salt. 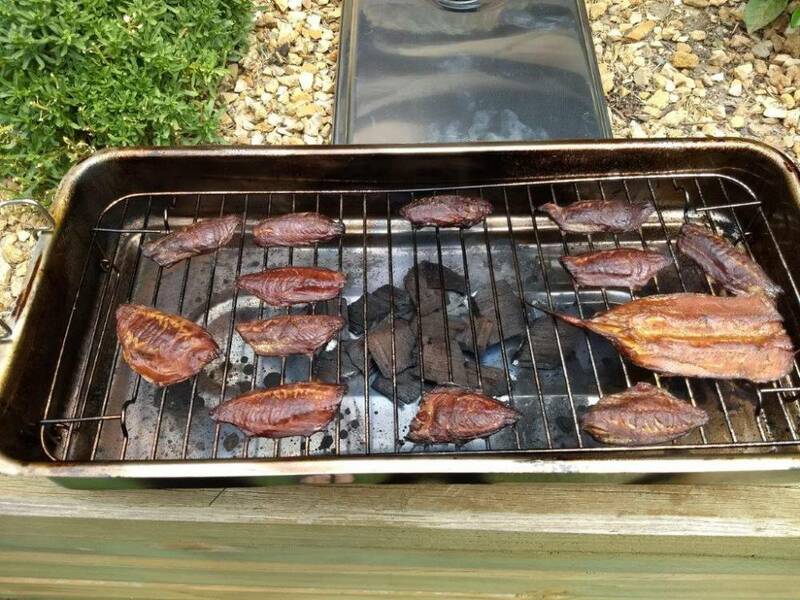 The tommies and Mackerel ,that I caught awhile back ,I fillet and do the rub thing, and fill my little metho burner to the brim ,when it runs out of metho they are smoked ,around 15......20 mins . I gave a lot away and all loved it . Mackerel is the favourite.